Bellsprout in game: 5,779 Who? Important notice! Pokemon Bellsprout is a fictional character of humans. 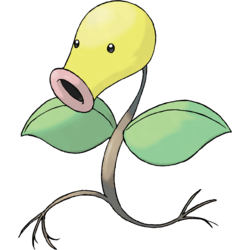 Bellsprout is a plant-based Pokémon with a stem-like brown body. This stem is long, thin and very flexible, making it capable of swerving rapidly to avoid many attacks or moving with blinding speed to capture prey. Its roots resemble feet, and it uses them as such. It will plant these feet in the ground to replenish water, but it is unable to flee while it is rooted. It has one green leaf on each side of its body. Its yellow head is bell-shaped and has what appear to be pink lips at the end. Bellsprout prefers hot and humid places, living in forests. 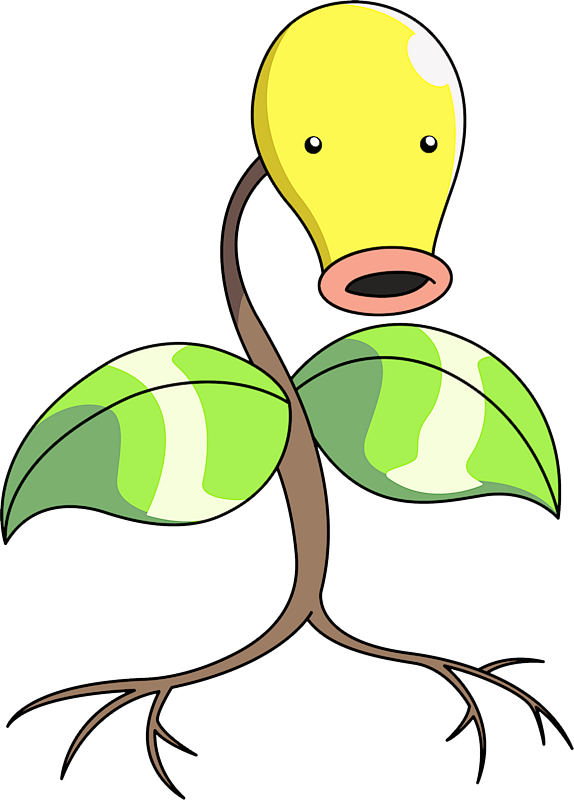 Bellsprout's first major appearance was in The Fourth Round Rumble, as Jeanette Fisher's Pokémon. This Bellsprout was unusually strong and managed to defeat Ash's Bulbasaur and Pikachu, but lost to Ash's Muk. It reappeared in a flashback in the following episode and in Bulbasaur... the Ambassador!. Another major appearance was in A Bout With Sprout. A boy called Zackie from Earl Dervish's Pokémon academy wanted to have Ash's Pikachu very badly. In his efforts to catch it, he captured a Bellsprout instead. This Bellsprout later saved the day when Team Rocket was causing trouble at the Sprout Tower. A Bellsprout named "Spoopy" appeared in A Better Pill to Swallow as Old Man Shuckle's Pokémon. It was able to run very fast and it could lift boulders. A very old Bellsprout appeared in PK13. It is the elder of the Summer Festival, and was the one who tells Pikachu and the others about an Aggron living on a deserted island, where Skarmory took Azumarill. A Bellsprout appeared in Who, What, When, Where, Wynaut? under the ownership of Roderick. A Bellsprout appeared in Defending the Homeland!, under the ownership of Keanan. It reappeared in Master Class is in Session!, Performing a Pathway to the Future!, and Facing the Needs of the Many!. Bellsprout first appeared in Primeape Goes Bananas. A Bellsprout also appeared in Pokémon Fashion Flash. A Bellsprout was seen in a Pokémon Center in Sparks Fly for Magnemite. Bellsprout also appeared in The Kangaskhan Kid and The March of the Exeggutor Squad, The Breeding Center Secret and Pallet Party Panic. A Bellsprout appeared in Mewtwo Strikes Back. Multiple pink Bellsprout resided on the Pinkan Island in In the Pink. Bellsprout also appeared in The Power of One. A Bellsprout was part of an exhibition in Flower Power. A Bellsprout belonging to the Nursing School, appeared in a flashback in Ignorance is Blissey. A Bellsprout was one of the Pokémon seen at the Pokémon Swap Meet in Tricks of the Trade. A Bellsprout was one of the sick Pokémon in a Pokémon Center in Carrying On!. A Bellsprout appeared in Beauty and the Breeder where it participated in a Pokémon breeding competition. A Bellsprout appeared on a poster in Imitation Confrontation. Two Bellsprout appeared in the wild in The Grass Route while two appeared in the same episode belonging to two different Trainers participating in the Grass Tournament. A Bellsprout also appeared in Celebi: Voice of the Forest. A Bellsprout was one of the inhabitants of an oasis just for Pokémon in Got Miltank?. Two Bellsprout were among the Pokémon seen at Wings Alexander's barn in Throwing in the Noctowl. A Bellsprout was seen in the wild in The Legend of Thunder!. A Bellsprout was one of the inhabitants of the Dragon Holy Land in Fangs for Nothin'. A Bellsprout was seen being fed by Tracey at Professor Oak's Laboratory in Johto Photo Finish. A Bellsprout was used by one of the students of the Pokémon Trainer's School in Gonna Rule The School!. A Bellsprout appeared in the opening of Lucario and the Mystery of Mew. A Coordinator's Bellsprout appeared in The Saffron Con as one of the Pokémon that were taken by Team Rocket. A Trainer's Bellsprout appeared in Off the Unbeaten Path participating in the Pokémon Orienteering. Another Bellsprout appeared in Pokémon Mystery Dungeon: Team Go-Getters Out of the Gate!. Bellsprout made a small appearance in The Rise of Darkrai as one of the Pokémon Darkrai hit with a Dark Void. It also appeared in Pokémon Ranger and the Kidnapped Riolu! Part One. Another Bellsprout appeared in Promoting Healthy Tangrowth!. Bellsprout appeared in Zoroark: Master of Illusions as a few of the many local Pokémon who lives in Crown City. A Bellsprout worked with several other Pokémon in surrounding Zorua at the park to attack him, angry at Zorua for what Zoroark did to the city. Before a fight broke out, Bellsprout, along with the other Pokémon, were calmed by Celebi. A Bellsprout appeared in Pikachu and the Pokémon Music Squad. Bellsprout makes a cameo in the Red, Green & Blue chapter in ...But Fearow Itself! when Red remembers capturing one. Bellsprout appeared as a silhouette when Green explains about Mew in The Jynx Jinx. Later, in Meanwhile...Vileplume! Erika of the Celadon Gym is seen in possession of a Bellsprout, who, despite its small size, was able to daze the fully-evolved Poli by mimicking its DoubleSlap. Later, during the Yellow chapter, it was revealed to have fully evolved. In A Hollow Victreebel a hidden colony of Bellsprout line members in the Safari Zone captured Red for their evolution ritual. With the help of Pidgebot 1 that was assigned to him, and a few good items he carried around, the Bellsprout that were about to eat him for their evolution were distracted, and he was able to flee. By morning Red had captured multiple Safari Zone Pokémon including several Bellsprout. A sextet of Bellsprout is seen in Bellsprout Rout during Gold's visit to Sprout Tower. Gold is attacked by the monks and their Bellsprout in an attempt to convince him to join their group. The excellent teamwork of the Bellsprout manages to make short work of Gold's Aipom, only to lose to Gold's Cyndaquil when it incinerates them from below. A picture and two statues of Bellsprout appeared by the side of the Sprout Tower in Bellsprout Rout. In The Last Battle XIII a Bellsprout was one of the Pokémon sent to help the fight in Ilex Forest. 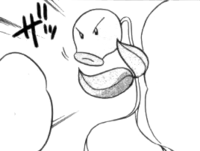 Shū has two Bellsprout in the Pokémon Gotta Catch 'Em All manga. He captured the first in a Pokémon capturing competition in Pokémon Get Match!!. He captured the second one in Plague on the Bellsprout. A Bellsprout's thin and flexible body lets it bend and sway to avoid any attack, however strong it may be. From its mouth, it leaks a fluid that melts even iron. Can delay your opponent's disruptions for two turns. Bellsprout can be seen as a parallel to Oddish. Both of them are Grass/Poison type Generation I Pokémon and are part of a three-stage evolutionary line, who evolve into their evolved forms at or above level 21, and whose second evolutionary event utilizes a Leaf Stone. Bellsprout is exclusive to Pokémon Blue and LeafGreen, while Oddish is exclusive to Pokémon Red and FireRed, with both Pokémon found in the same locations in their respective versions. Additionally, both can be found at White Forest in Pokémon White, and both Pokémon have had their Egg designs revealed. Cantonese Chinese 喇叭芽 Lābāngàh Literally "Trumpet sprout"